Common to abundant, yearlong resident or elevational migrant with a widespread distribution throughout most of California, except in deserts and intensively farmed areas without cover (Longhurst et al. 1952, Ingles 1965). Occur in early to intermediate successional stages of most forest, woodland, and brush habitats. Prefer a mosaic of various-aged vegetation that provides woody cover, meadow and shrubby openings, and free water. 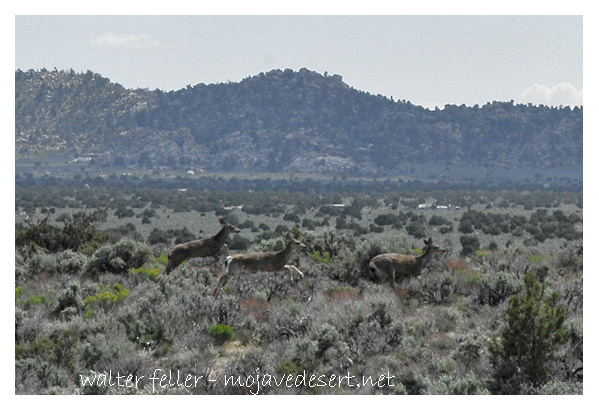 Feeding: Mule deer browse and graze. Prefer tender new growth of various shrubs (e.g., ceanothus, mountain mahogany, bitterbrush), many forbs, and a few grasses (Wallmo 1978, 1981). Forage from ground surface into bushes and trees as high as can reach. Also dig out subterranean mushrooms. Food preferences vary with season, forage quality, and availability. Forbs and grasses are important in spring. Feed heavily on acorns where available, primarily in autumn. Various shrubs are critical in summer and winter. Commonly frequent salt or mineral licks. Cover: Brushy areas and tree thickets are important for escape cover. Vegetative cover critical for thermal regulation in winter and summer. Frequent various aspects of habitat during the year to aid in thermal regulation (e.g., use south-facing slopes more in cold weather, and north-facing slopes more in hot weather). Reproduction: Fawning occurs in moderately dense shrublands and forests, dense herbaceous stands, and high-elevation riparian and mountain shrub habitats, with available water and abundant forage. Water: Deer require about 2.81 (3 qt) of water/day/45 kg (100 Ib) of body weight. Pattern: Suitable habitat is a mosaic of vegetation, providing an interspersion of herbaceous openings, dense brush or tree thickets, riparian areas, and abundant edge. 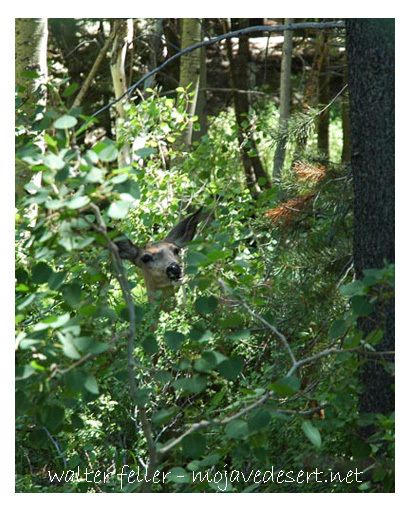 Activity Patterns: Mule deer generally are crepuscular, but may be active day or night. Miller (1970) found that activity patterns were influenced by abrupt changes or extremes in temperature, precipitation, and relative humidity. Seasonal Movements/Migration: May be resident or migratory. In the mountains of California, migrate downslope in winter, to areas having less than 46 cm (18 in) of snow. As the snow melts, migrate to higher elevations to the summer range. Home Range: Typical home ranges of small doe and fawn groups were 1-3 km² (0.4- 1.1 mi²), but varied from 0.5 to 5.0 km² (0.2 to 1.9 mi²) in Lake Co. (Taber and Dasmann 1958). Bucks usually have larger home ranges, and travel longer distances than doe and fawn groups (Brown 1961). Statewide densities of 7-23 deer/km² (18-60/mi²) are typical, varying from 2-40/km² (5-104/mi²) (Longhurst et al. 1952). Home ranges usually are less than 1.6 km (1 mi) in diameter. Dasmann and Taber (1956) and Miller (1970) reported that the home range consists of many small areas from which the deer obtains its life requisites. Individual deer may use parts of the home range only seasonally. Territory: Adult does may defend small areas in late spring and early summer when caring for newborn fawns. Usually area includes immediate vicinity surrounding the fawns, and changes with daily movements. Does may defend this territory from all deer and predators. In Lake Co., these territories averaged 0.14 km² (0.09 mi²) (Dasmann and Taber 1956). Bucks usually solitary, although may associate in small groups. In spring and summer, several groups of bucks may associate to form feeding herds. However, each group maintains an individual distance from the others, and retains its integrity. As rut begins, individuals disperse, and tend to avoid each other during mating activities. Reproduction: Mule deer are serially polygynous. Rutting season occurs in autumn. A dominant buck tends an estrous doe until matings are completed, or the buck is displaced by another buck. Bucks do not keep harems. Gestation period is 195-212 days. Fawns are born from early April to midsummer, varying geographically. Fawning peaks from late April through mid-June. Males and females are mature sexually at 1.5 yr. Twins are common after the first or second fawning; triplets are rare. Mule deer may live more than 10 yr in the wild, and longer in captivity (Taylor 1956, Wallmo 1981, Anderson and Wallmo 1984). Niche: Natural predators of deer have been reduced in numbers in most areas. Overpopulation, with resultant winter die-offs and destruction of habitat, occurs periodically in California, as in other states. Mule deer are preyed upon regularly by mountain lions and coyotes, and occasionally by bobcats, black bears, and domestic dogs. Deer populations can respond rapidly to habitat management. However, populations can decline in response to fragmentation, degradation, or destruction of habitat caused by urban expansion, incompatible use of land resources (e.g., timber, water, rangeland), and disturbances by humans. Mule deer compete potentially for food with domestic cattle and sheep, wild horses, wild pigs, and black bears. Six subspecies occur in California, of which O. h. columbianus, the black-tailed deer, and O. h. californicus, the California mule deer, are the most abundant and widespread (Ingles 1965, Hall 1981). Bucks average about about 200 pounds, does roughly 125. The doe mule deer stands about 3 feet at the shoulders and bucks about 3 1/2 feet. Bucks are the only ones who grow antlers, which fall off and are regrown annually. Bucks and does tend to remain apart except in fall mating. Mountain lions are the only regular predators of mule deer. Coyotes, on occasion, will work together to take a fawn. Mule deer prefer "edge" habitats and tend to move up or down with their preferred foods. Mule deer rarely travel far from water or forage, and tend to bed down within easy walking distance of both. Young mule deer and does tend to forage together in family groups while bucks tend to travel alone or with other bucks. Most actively forage around dawn and dusk.